RENE DE LATOUR sums up the 1960 Tour de France. He writes about Nencini, the "best-all-rounder" of the race, and what might have happened but for the tragic accident to Roger Riviere. TWENTY-TWO days of noise and bustle are over. Each year it is the same. And now the helicopters have come on to the scene. In recent years we have had those of the police (keeping their eyes on the traffic situation) and the Aspro firm (whose hovering ambulance is ready to drop down from the skies whenever a serious accident takes place). 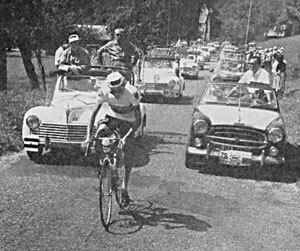 And now this year the climb to the top of the Peyresourde and other mountain passes was accompanied by the din of the television helicopter, with a cameraman leaning out to get shots of Gimmi and Massignan toiling to the top amid the long corridors of colourful crowds. The noise is over . .. and it is good to sit back in the quiet and look back on the race. Whatever is said about the Tour, it remains the most brilliant sports show in the world. This year we had in the caravan an American writer who thought he had seen everything. He hadn't. He hadn't seen the Tour until this year, and now he has gone back to the States enthusing about the fantastic organisation and super-fitness of the men who contest it. Later on in the article I will say a few things about Your English boys, although no doubt friend Wadley will have covered them in his own series of stories. It is natural that his eyes should have been focused more intently on Robinson, Simpson and Co. than mine. My job was to survey the race as a whole, and I think you will find a few of my thoughts of interest. Any reporter returning from the Tour is immediately asked this question by his friends and neighbours " Was it a good Tour, or a bad one?" Now that is a question we in turn ask our friends. because a Tour may be extremely interesting to follow on the radio and via the newspapers - and yet relatively dull to follow in person. It can also be the other way round, of course. It was certainly the way this year. 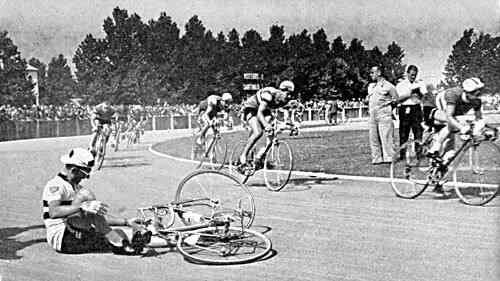 For my part I thought that the 1960 Tour de France was more interesting from the very start at Lille than any of the 24 I have followed. Yet the general public thought differently. Even before the start many were convinced that it would be uninteresting. How could it be? Anquetil was not riding; he'd just won the Giro d'Italia and was content to rest on his laurels. Van Looy was a non-starter, too, and so was Charly Gaul. And then, when Bahamontes retired without glory after two days, the doubters were certain. How could the Tour be interesting without the stars ? But as I have often said in my articles, it is the Tour de France which makes the riders famous, and not the riders which make the Tour's fame. 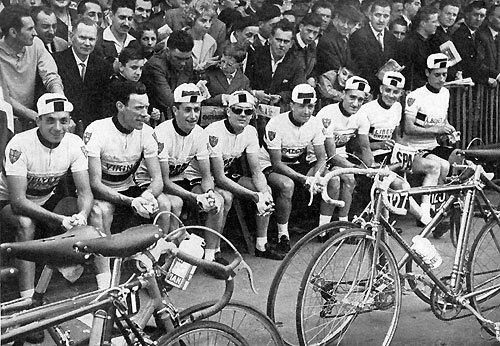 Koblet, Bobet, Kubler, Gaul - or even the great Fausto himself. In their day, team-mates were inclined to control the race in their favour - but here with no outstanding men " on paper " there was every chance for the aggressive rider to attack. I say " every chance," although I expect on this score Tom Simpson will disagree with me. He contends - as do many others - that the formula this year was not a sporting one. The teams were unequal - not on quality, which cannot be avoided, but numerically. My French compatriots had fourteen riders, as did the Italians, Belgians and Spanish. Yours, and the other teams, had only eight. "This isn't fair," they said. "What will happen to the little teams after a few riders have been eliminated by accidents and tiredness ? A possible winner may be left in - but what chance will he have?" "How about if this sort of thing happened in football. Would one team accept to play with only nine players against a full eleven ? Or in the boxing ring, would one fighter be allowed to use gloves lighter than his opponent?" Riviere's opinion neatly summed up that of most of the riders and public. We knew at Lille that the " small " teams would be at a disadvantage ; as the race progressed we followers were inclined to forget the fact, but the riders did not. The "small" men soon found the handicap of being outnumbered so heavily by men who were, in any case, of a higher standard of racing ability. In the big teams, when a rider punctured, there were always five or six team-mates ready to wait behind and quickly get the victim back to the bunch after his wheel had been changed. There were still eight men left in the main group. If a man from the eight-man team had a similar mishap, however, then three was the most who Could be spared to wait back. And after a while when the team got reduced, sometimes it was almost necessary for the whole team to hang back if one of their number punctured. Yes, when Tom Simpson complained of the inequality of the teams he was expressing a real grievance. It didn't matter so much to a rider of Robinson's experience and patience, but to the impetuous Tom who wanted to be in the struggle from the very first day, then it was a great drawback. From the first half-stage from Lille to Brussels, Simpson's name was down in the notebooks of Bidot, Ronsse and Binda, the directors of the three biggest teams. Certain men were detailed to "look after" the Englishman whenever he got too enterprising. Was it plain, before the start, that the Italians were going to dominate this Tour de France ? It is always easy to be wise after the event. Of course we knew that a team containing Baldini, Nencini, Massignan and Pambianco stood a strong chance. By "we" I mean those of us whose job it is to follow all the main races of the year, and who are more qualified to judge than most. 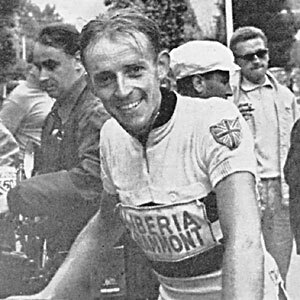 But I would be an awful liar if I didn't admit that before the race I would have bet my shirt on a French victory, even without Anquetil. .. . I remember once discussing the modern Italian rider with the great Fausto Coppi. 1 asked him what he thought of Nencini. "Nencini? Yes, he is a very strong boy. 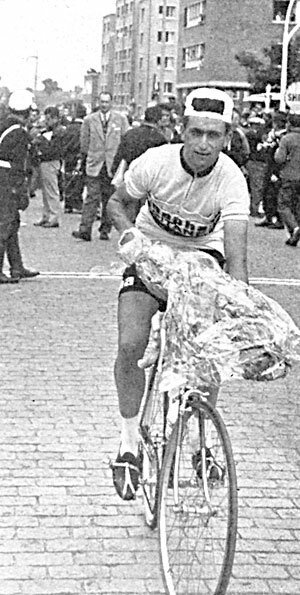 Very willing, too. . . ."
This was all Fausto would say, and what he left unsaid was this : that Nencini was just a good rider among many others. And yet had great Coppi lived, he would have seen Nencini emerge as the "best all-rounder" of the 1960 Tour. 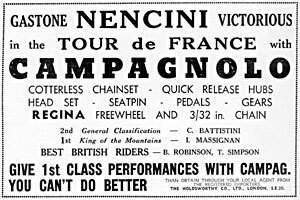 Nencini was never outstanding ; he never even won a stage. But he was "present" every day at or near the front of the field, or at least with the danger-men. Is Nencini a clever rider ? If it is clever to pick out the right chances in a race and to pick up minutes in a break that is not killing, then Nencini is a clever rider. If it is clever to make friends all round in the bunch without stirring up personal feelings and causing rivals to ride deliberately against you, then Nencini is clever. And if it is clever to know just how much work to put into an effort without exhausting yourself completely, and to think of tomorrow, then Nencini indeed is really clever. Nencini got off to a flying start in the Tour. He has said since that he expected to be about five minutes back after the first time trial at Brussels. Instead he found himself with the maillot jaune! Although be defended it with energy for the first day - as poor Tom Simpson knows - be took Binda's advice and "let it slide" at Dieppe on to another's shoulders. It was too early to make an all-out defence of the leadership. Groussard took the jersey at Dieppe, and Nencini was almost as happy as he was. But the next night at Caen the position was not ,so rosy. The Anglade- Graczyk-Baldini break had put him back to six minutes. Nencini was not complaining. He had an agreement with Baldini that they would not binder each other, and with Baldini away, be had respected his word in the main bunch behind. Knowing that Baldini would keep his word, too, and not interfere with any effort of his own, Nencini engineered the famous St. Malo-Lorient break with Riviere, Adriaenssens and Junkermann. That break gave the Belgian the maillot jaune, but put Nencini and Riviere in the position from which - but for Riviere's terrible crash - they should have fought out the Tour. That was an awful moment. When we first arrived on the scene of the accident and saw the 60-foot jump he must have made from the road, it did not seem possible that Riviere could be alive. Mercifully he was, but at the moment I write, it is still not possible to say whether the boy will ever race again. Whether he comes back to competition or not, there will always be those to say that he would have won the 1960 Tour de France. I am not so sure that this is true. There were still eight days of the Tour to go, including the toughest country of the lot, the approaches to the Alps, and the Alps themselves. 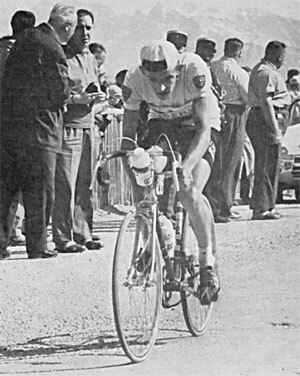 Already in the Pyrenees Riviere had allowed Nencini to steal some time from him - notably on the Peyresourde, the hill on which Tom Simpson was the only one brave enough to try to hold the Italian's wheel (the Swiss rider Gimmi was far ahead on the road, but this was without importance to the overall position). If he could do that in the Pyrenees, when Riviere was still comparatively fresh, it is reasonable to suppose he would have given Riviere an even rougher time in the Alps. Nencini is a stage race veteran, Riviere still a virtual novice. . . . The argument has been put forward that during the Alps by some means or other - uphill or downhill Nencini would have had to gain five minutes on Riviere. They were sure that Riviere would beat Nencini by that much in the 83 kms. time trial two days from the finish. I am not so sure. Had the time trial been an ordinary one, that is not in a stage race but with several clear days before, then Riviere certainly would beat Nencini by that much, and probably more. But in a tough stage race Riviere might have been "used" so much that he would have done well to beat Nencini by two minutes. We have a saying in France, "Il n'y a que le resultat qui compte" only results count. And the results, until Riviere's retirement, were in favour of Nencini. . . . Yet, had he known, Riviere once had Nencini at his mercy in the Pyrenees. It was the day of the Portet d'Aspet climb, on the LuchonToulouse stage. It was raining and it was cold. For some reason Nencini found himself without team-mates by his side, but surrounded by French nationals, including Riviere, Anglade and Rostollan. Nencini was suffering; his legs went lifeless, he couldn't breath. He sensed that if an attack came on him he wouldn't be able to answer it. He could already see his precious maillot jaune on Riviere's shoulders. So do not let us belittle Nencini's victory. It was not his fault that he merely had to defend his jersey after Riviere's accident. For me, his victory was "sympathetique". I like Gastone. I have seen him in many Tours of Italy, and most of the Italian classics. He doesn't smile much, his handshake is sincere - like his efforts on the bike. He rarely deceives his fans. Maybe he will never win another Tour de France, but let us give him credit for winning this. Let us give credit, too, to the good spirit that prevailed in the Italian camp. On paper manager Binda had a tough job on his plate before the race, but he really had very little trouble with his troops. The same, unfortunately, cannot be said of Marcel Bidot and his French nationals. I am sure you have heard of the famous Riviere-Anglade squabble. When Jacques Anquetil decided not to ride the Tour it seemed Bidot's troubles would only be little ones. Hungry? A team-mate will give up the contents of his musette. Thirsty? A team-mate will hand over his bidon, even though he is craving for a drink himself. Or he will stop at a wayside pump, or “raid" a cafe for mineral water, then plod back to the bunch with a bidon of fresh drink for his leader. A puncture? Three or four men always there to pace the victim back. Tired? Surrounded by team-mates the leader is never abandoned, and if the going is tough, he will feel a gentle shove on his back. These were the privileges enjoyed by Anglade and Riviere. A few days before the race they came to a gentleman's agreement ; neither would do anything to impair the chances of the other. Towards the end of the first week Anglade thought everything was going smoothly. He admired himself in the mirror, thinking he looked nice in yellow. . . . He had fought hard for this honour. The day he took the jersey, at Caen in Normandy, he had been helped "back in the bunch" by Riviere himself, who (together with Nencini, of course) lost 6 min. 19 sec. on Anglade. "I've had my good day," said Anglade to Riviere afterwards. "Now you must have yours, and I will help you just the same." The "good day" was very near for Riviere, just 48 hours ahead in fact. And what a day ! I know the Editor has dealt fully with this epic break by Riviere, Junkermann, Nencini and Adriaenssens, which was run off at over 28 m.p.h. I was "floating" in my car between the break and the main group. As Riviere forged on ahead like mad, Anglade was mad in another way behind. He could see the way things were going that he would lose his race leadership to Adriaenssens. "Riviere is a traitor," he called out to us as we passed. " I should never have trusted him." At the finish of the stage on the Lorient track, where Riviere had rubbed it in still further by getting the minute bonus for winning the sprint from Nencini, his words were even harsher. He threatened to go home. "Our agreement was to protect any French leader," he said. "Riviere had no right to do that. He brings up a man like Adriaenssens, who is a possible winner, to lead the race. And I know he played this dirty trick on me after plotting the break with Nencini. Is this team spirit?" Many of us thought Anglade wrong. So did some of his team-mates - and Marcel Bidot. "You're wrong, Anglade," said Bidot. "Team spirit does not mean that a rider of Riviere's class must abandon his own chances for you so far from the end of the Tour. If you attack again, Riviere will not lift a finger against you." This assurance did not convince Anglade, and he subsequently acted as if Riviere were not in his team. "I do not feel guilty," Riviere told me. "The Tour is a long race, and because Anglade was lucky enough to take the lead, I do not see why we should all fight for him so early. I have my own reputation to defend, and it's up to me to take any chance I see." Poor Marcel Bidot still hadn't brought the two together when Riviere so tragically disappeared from the race. Now let me say a word or two about two team-mates who made the grade, two domestiques or water-carriers. First, the timid Grazziano Battistini, who finished runner-up to Nencini. Had he not worked so hard as a team-mate earlier in the Tour, and had he occupied the position of a protected leader, then he might even have won the Tour. Whether he will be made a leader next year remains to be seen. Probably not - unless he wins Milan-San Remo or another Italian classic. The French had their Battistini, too. His name, Raymond Mastrotto, who had been put in the French team as a " servant " to Riviere or Anglade. The husky Raymond is from the Pyrenees and used to work on his father's farm. In the Tour he worked as hard as any cart-horse, on many obscure tasks in favour of his team leaders. Usually when a rider does that he ends up near the tail of the field on final classification - but, like Battistini, he was way up at the front and was the best placed Frenchman at the Pare des Princes, only 16 minutes behind Nencini. For most of us, Mastrotto was the virtual winner of the 83 kms. time trial two days from home. True, the results show Graf beat him by 1 1/2 minutes (Graf did 1-59-28), but whereas Mastrotto had been working hard all the Tour, the Swiss had been lying low for days, preparing for this feat. In form, Mastrotto will have to be considered as a leader in next year's Tour, with others filling water-bottles for him. And even if Anquetil, Gaul, Bahamontes and Van Looy are in the race, a Mastrotto victory in 1961 would not be impossible. And how about our British riders ? Well, Simpson made the headlines in your newspapers as well as ours. He is now immensely popular in France, and rode the right kind of race to satisfy his fans. He has now a nice big list of road and track engagements as a result. Had he controlled his efforts, he certainly could have filled a much higher place on general classification than his 29th. But I can't blame Tom for riding the race he did - with certain exceptions. One exception was on the dangerous cinder track at Saint Malo when Tom sprinted hard for seventh place and fell. His injuries weren't serious, but they might have been. Take a risk on such a track if the first place is at stake, yes - but better to play safe and wait for another day if it is not. Brian Robinson rode a good race. 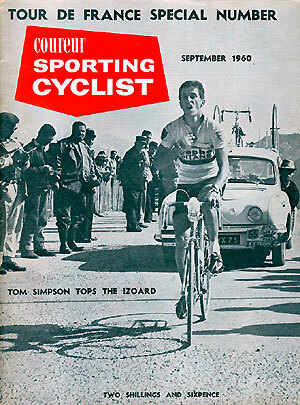 He loyally helped Simpson after his fall on the Aubisque. Had he not waited, he wouldn't have been far off winning at Pau, and at the appropriately named Briancon, again, he was unlucky not to be with the leaders ; he punctured and fell on the descent after a splendid climb of L’Izoard. Like Simpson, Brian has voted for trade, rather than national teams. I can understand their point of view. At the moment Britain has not the team-mates to back them up. Normally Sutton would have been all right, and so would Reynolds, who is what we call " brand new " and capable of becoming a very good rider. Of the other Britishers, I thought Shell did well to last as long as he did after only three months road-race apprenticeship. Andrews and Kennedy were at home on the long, flat stages, but unable to cope with the mountains, while Brittain had to quit a day from the Pyrenees. A pity. I saw him working well for the team many times, and but for his illness he would have made the finish all right. But Simpson and Co. did all right. So did the Italians, with the Yellow Jersey, second, and Grand Prix de la Montague. On paper the French didn't do so well. Only Graczyk's Green Jersey. But look what the team earned on the way : a cool £12,000. They did all right, too. . . .